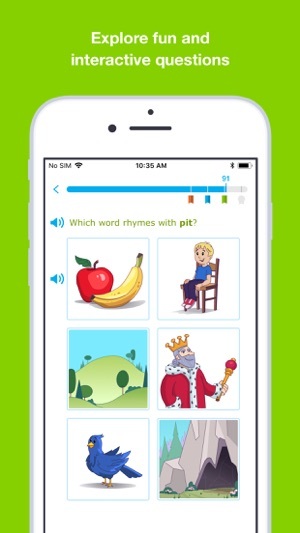 Master skills on the go with IXL! Discover a world of learning with interactive questions in over 5,700 skills for math and English language arts. Take on exciting new challenges, explore personalized recommendations, and earn virtual awards. 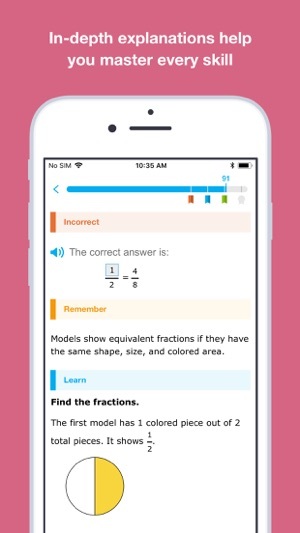 And, feel good about your screen time as you keep skills sharp anytime, anywhere, on the SIIA CODiE award-winning Best PK-12 Educational App for a Mobile Device (2017 and 2018). Now available on both iPhone and iPad! From skip-counting with pictures to graphing quadratic functions, IXL's interactive math questions put the joy of learning at students’ fingertips. Explore more than 3,800 skills that provide comprehensive coverage of pre-K through 12th grade math. Unlimited questions allow students to review and practice as much as they need to master each skill. 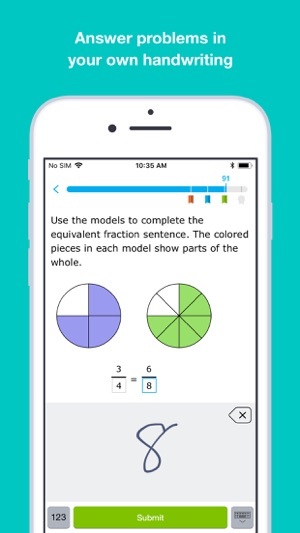 And with a variety of fun question types, colorful graphics, and a handwriting recognition feature, IXL makes math learning an immersive experience. Build strong readers and writers with IXL’s English language arts program for pre-K through twelfth grade. We bring the fundamentals of writing to life through fun and witty questions that challenge students to learn new vocabulary, correct grammatical mistakes, read and analyze text, develop writing skills, and more. Over 1,900 skills prepare kids to become confident communicators in school and beyond. 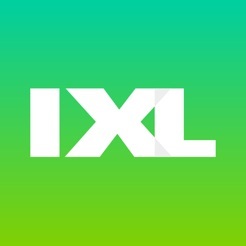 “Thanks to IXL, our students' performance has increased dramatically. 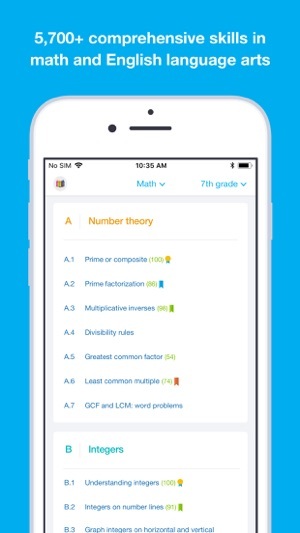 Because they practice the skills daily, and because the site provides feedback, students are able to correct their mistakes and master the concepts easily.” - Waleska Batista, teacher, Cherry Hill, New Jersey, U.S.A.
“This program takes the frustration out of math because it allows the student to practice at his/her own pace and stay focused. It's okay if you mark one wrong because another one will be waiting. 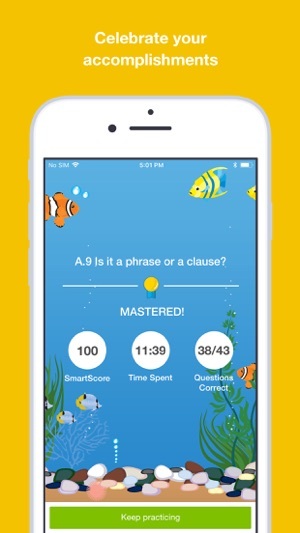 This is a great tool to have.” - Parent of a 4th grader, California, U.S.A.
“My students are improving by the day, and some even stay in for recess to work on IXL!” - Helm Jackson, 5th grade teacher, Redmond, Washington, U.S.A. Become an IXL member for $19.99 per month and you’ll get access to a fully personalized learning experience - complete with comprehensive curriculum and guidance, meaningful analytics, and fun awards and milestones! Pricing may vary by country. Your subscription will be charged through your iTunes account at confirmation of purchase and will automatically renew within 24 hours prior to the end of the current subscription period, unless auto-renewal is turned off beforehand. You may manage your subscription and turn off auto-renewal at any time from your iTunes account settings after purchase, but no refunds will be provided for the unused portion of the period. IXL has many worlds with a variety of difficulties, the side quest of collecting pictures is boring, as you need to go through the main quest to do it anyway. While their is some good enemy variety, the boss rush section is just the same enemies but a little harder. Your character can be anything from a fish to a soccer ball, which gives the world a wacky feel, but the lack of memorable locales don’t deliver on that wackyness that the characters give off. Lack of any memorable music tracks, and the level design is uncreative, just enemy after enemy. There isn’t any reward for beating levels, other than the pictures, you don’t get stronger or level up either, making the game just as slow at the end as it was in the beginning. The enemy variety offers good replay value for the levels. The game could be very forgiving telling you what you did wrong if you fail, and the harder difficulty you have, the more the game punishes you for failing but still teaches you that levels mechanics. Sometimes the levels were a great big slog, as eventually I didn’t feel like losing to the same enemies over and over, and if you fail too much in the boss rush section, you can be sent back to standard enemies, and go as far back as the beginning of the level, there isn’t any difficulty spikes, as the game is an open world, letting you choose your own path. Overall, IXL had a lot of promise that the developers didn’t deliver. I have my students do IXL. They all they that they hate it. They also say that it is not fair. They say that when they get a question correct it gives them 1-5 points closer to 100 and takes away 10 points when you are wrong. I have reviewed it with my students and have noticed it is true. I have students that are in different classes such as Gifted&Talented who give me the same report. The company should make the opposite that you earn 10 points and lose 1-5 points. I feel very bad for my students that struggle with particular subjects like the ones that they are participating in IXL. I feel bad for the kids all around the world. Even this happens on their online website! I hope everyone who has read this review agrees and tries to get them to change. At least the company should change the score system. If this happens for a long more amount of time I will take my students off and quit this site. I am dead serious. Please do not add nasty comments to my review because I am not in the mood for that. Please don’t say that I am to rude and incorrect. Everyone has there own opinions no matter if they are good are bad they all count. Thank you!